On Sunday 20th September, the South East London Combined Heat and Power (SELCHP) plant in New Cross, opened its doors to the general public again as part of the annual Open House event that happens across the capital. For those who are not familiar with what SELCHP does or what it is, put simply, this is where all of the rubbish that goes into your black bin ends up. Once inside the SELCHP plant, all of this rubbish is incinerated. The burning of rubbish and all of the processes involved with this is clearly something that many people are curious about as the event is very well attended. This is why Lewisham Council’s Recycling Team also attended so that they could speak to many of the attendee’s about waste and in particular recycling and composting. 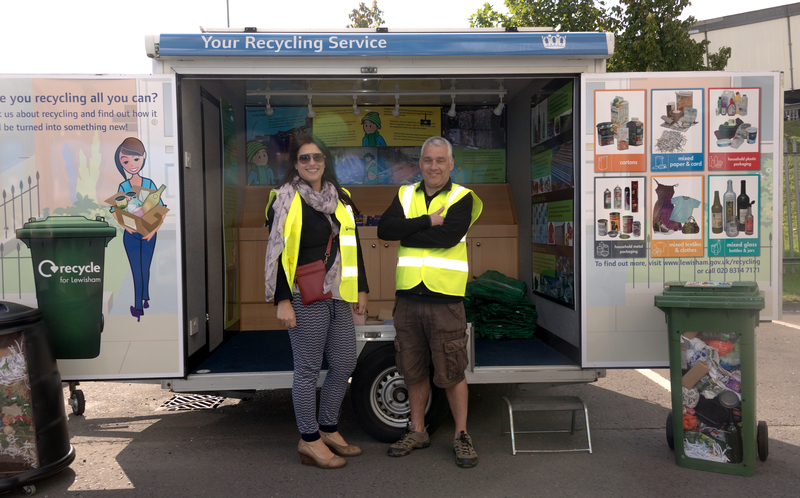 Kate and Paddy from the Council’s Recycling Team spoke to over 100 people throughout the day. The recycling trailer was kept busy all day long with inquiries about recycling and composting. This gave Kate and Paddy from Lewisham’s Recycling Team a chance to speak more in depth about the on going consultation to the Lewisham residents that attended. It was also an opportunity to tell people about the change in policy of collecting textiles. This is something that we want everyone in the borough to be made aware of. If you have textiles that you no longer want, please use a textile bank to dispose of them or a charity shop. Otherwise they will be soiled and ruined beyond use and classed as contamination if they go inside of your recycling bin. Categories: community engagement, Environmental Campaigns, Food waste, garden waste, SELCHP | Tags: Kate Parkinson, Let's Talk Rubbish, Lewisham Consultation 2015, Lewisham incinerator, Lewisham's recycling team, no more textiles in the recycling bin, Open House, Open House 2015, Open House Event 2015, Paddy Swift, recycling team lewisham, SELCHP, SELCHP Open Day, South East London Combined Heat and Power | Permalink. 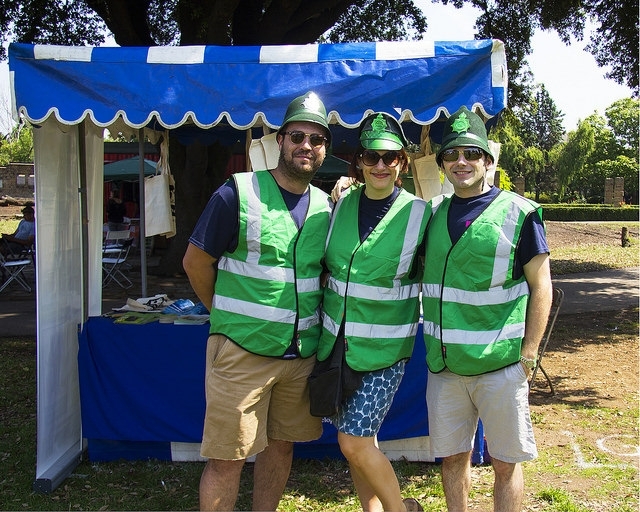 People’s Day 2014 and the Green Police were out in force again arresting anyone they caught not recycling and dealing with their waste properly. Many people came to see the recycling stall near the bandstand in Mountsfield Park on what was a lovely summers day and took away the odd freebie (spaghetti and rice measurers, pens, pencils, rulers, cotton shopping bags etc.) or just some information they were after. Over 150 people visited the recycling stall which also benefitted from being situated right next to the man eating compost heap called Compost Mentis. 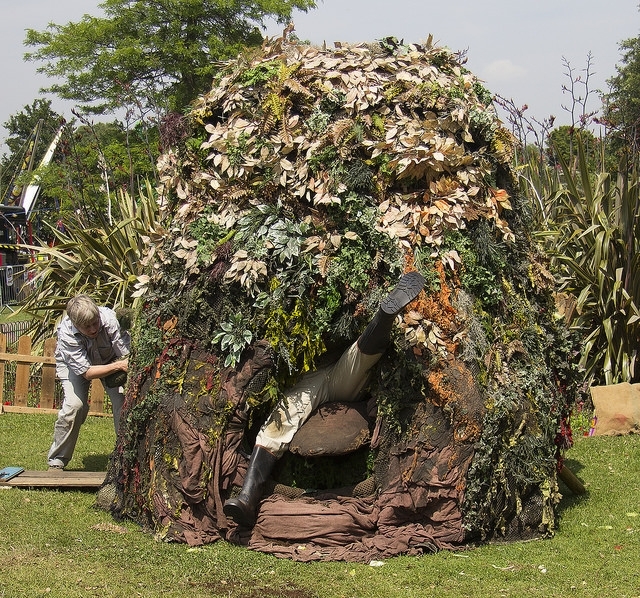 This was a small theatrical performance by 3 actors which served to highlight the benefits of composting whose star performer was a huge compost heap that comes to life and eventually devours the disgruntled gardener who seems to spend his time in the garden getting annoyed. 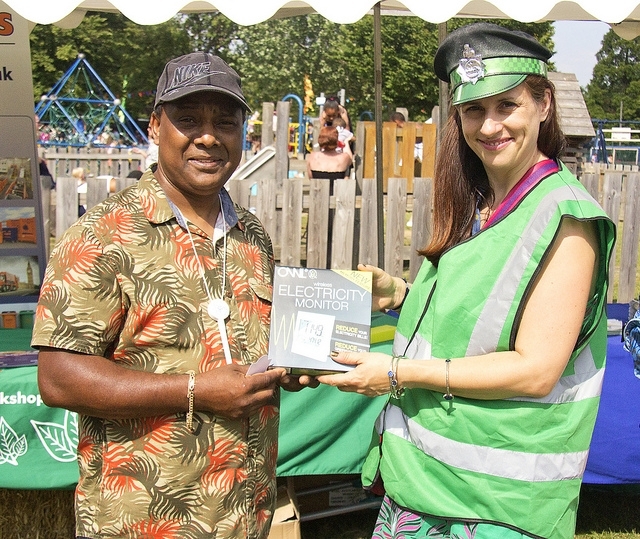 This year like last year, the Green Police aka Lewisham’s Recycling Team were joined by a new recruit from Bywaters, the company that takes all of the recyclables that are collected in the recycling bins across the borough. Dave Bowman (Recycling Quality and Tipping Relations Manager) was on hand to answer all those tricky questions posed by residents regarding what happens after all those tins, cans, bottles, cardboard, paper and beverage cartons are tipped into the back of a recycling vehicle. It was very useful having him there as there were quite a few residents that were intent on grilling him and finding out all about the sorting and separating processes. 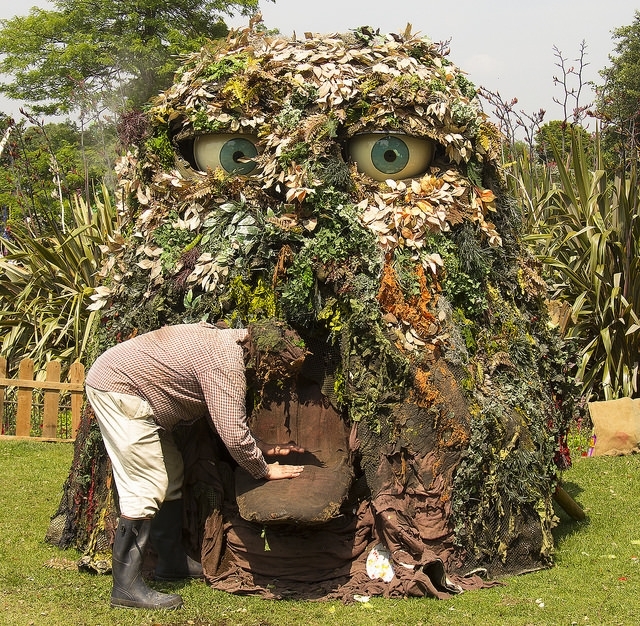 Categories: community engagement, garden waste, Uncategorized | Tags: Bywaters, Bywaters at People's Day 2014, Compost Mentis, composting at People's Day 2014, composting in Lewisham, Green Police, Green Police at Peoples Day 2014, Lewisham People's Day 2014, love food hate waste, People's Day 2014 | Permalink. 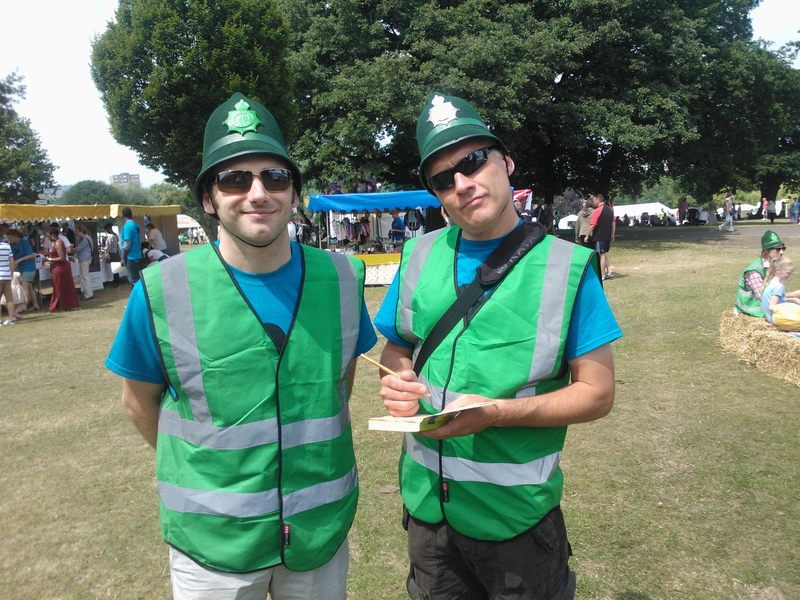 The 2013 People’s Day saw Lewisham’s recycling team out in force again as Green Police – serving and protecting the environment. This year we were fighting the environmental battle on three fronts. On one stand we were tackling recycling and waste management issues, on another we were running composting workshops, whilst on a third stand, we worked in partnership with Love Food Hate Waste to run cooking demo’s and advise people how to get the most out of buying, cooking and storing food. Also helping that day was Ed Van Reenen from Bywaters where all of the boroughs recycling is processed. 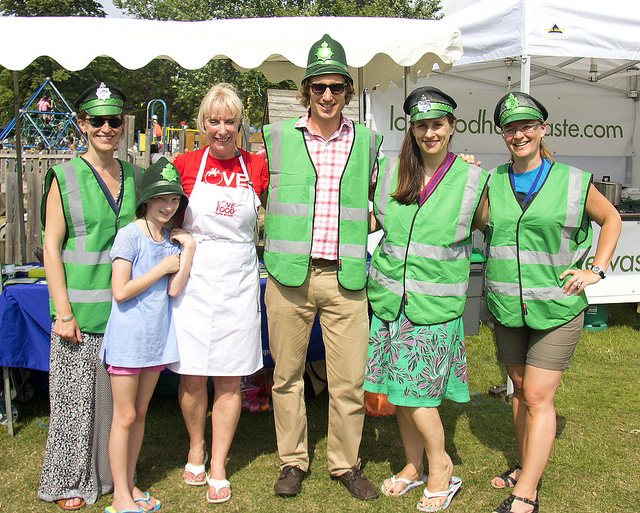 The Green Police Recycling Team with Monica and her daughter Lilian from Love Food Hate Waste and Ed from Bywaters. With so many people visiting us, we took the opportunity to speak to them about the new Service Standards that are now coming in to force which some people were still unaware of. The Service Standards are being rolled out borough-wide and are designed to standardise both the refuse and recycling service. Under the Standards, residents will have to bring their refuse and recycling bins to the inside boundary of their property. As people are now reducing their waste considerably these days, our crews will assume that if the bin isn’t at the boundary of the property, then the resident is either on holiday or doesn’t want a collection that week. As well as all of the above, the recycling team were raffling off some environmentally friendly products to lucky winners. The prizes were either a wireless meter reader that tells you how much electricity you are using, a device for turning all your gadgets and electrical devices off from standby or a wind up radio and torch. Regular draws were made throughout the afternoon and many people went home very happy with a prize that will help them reduce their electricity bills or save them buying batteries for their radio. 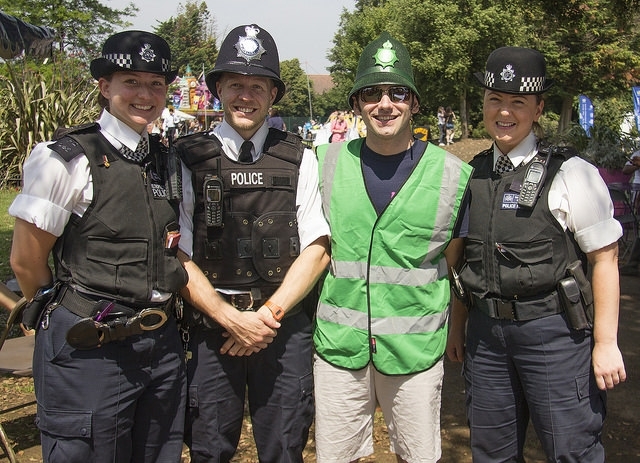 Even in the searing heat, the Green Police still managed to talk to lots of residents and many cooking demonstrations also took place. Overall a very productive day for the team with no arrests being made for people recycling the wrong things. Categories: community engagement, Environmental Campaigns, Food waste, garden waste, Uncategorized | Tags: Dave Brinson, Green Police 2013, Green Police at People's Day 2013, Kristina Binns, love food hate waste, Love Food Hate Waste at People's Day, Monica Price, Paddy Swift, People's Day, People's Day 2013, Recycling at People's Day 2013, Sam Kirk | Permalink. A rubbish diet that we can guarantee will work! With Summer on its way, many of us consider going on a diet, shedding a few pounds to feel healthier or to try and fit into last years swim suit. This year, Lewisham’s recycling team thought it might be an idea to try out a diet with a difference. We have set a challenge to Deptford based childminder, Charlotte Kelly- Skinner, to try out a ‘rubbish diet’- on her wheelie bin! Over the next eight weeks, Charlotte will see if she can reduce the amount of rubbish she places into her grey domestic refuse bin. 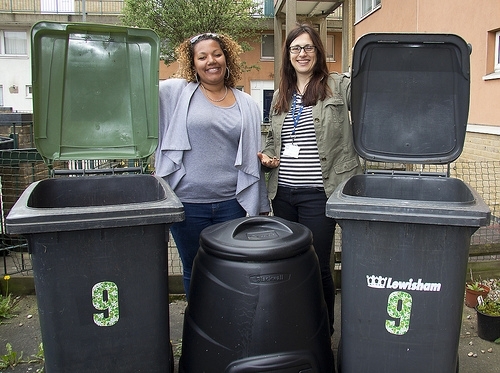 Inspired by colleagues in St Edmundsbury Borough Council, Suffolk, where a number of residents have been starving their rubbish bins and helping decrease the overall amount the council sends to landfill (in Lewisham’s case, incineration). So what does a ‘rubbish diet’ entail? Well, really very little effort is needed. Unlike other diets, you won’t have to change your eating habits. Just look at our top five tips listed below and if you start trying these out, you too can join in and slim down your bin so its in tip top shape for summer! Shop with waste in mind– Start to plan meals, making a list of the ingredients needed and stick to this when shopping. Always take your own bag and try and buy fruit and vegetables which are unpackaged. Think about your food waste– Try not to cook more than you need by measuring quantities before cooking. If you do have leftovers, cool, cover and save them in the fridge or freezer. 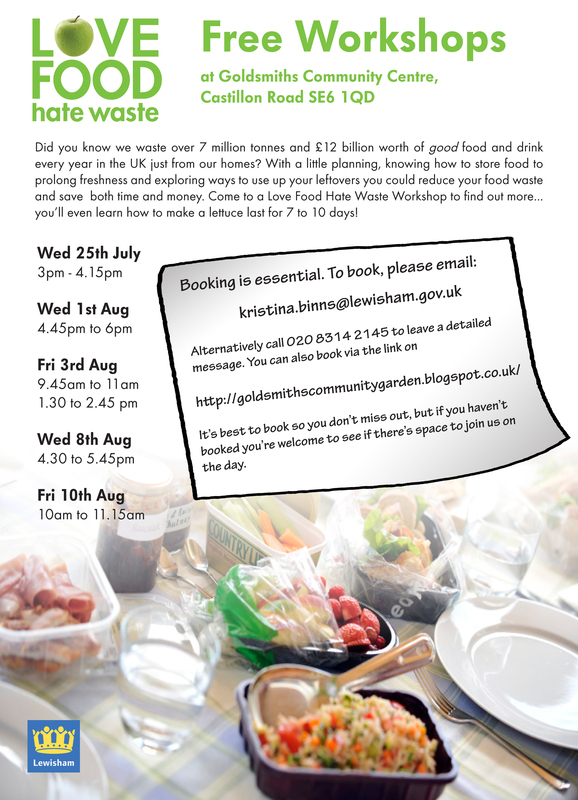 See http://www.lovefoodhatewaste.com/ for more info. Ditch the disposable– Could you do without buying cling film and silver foil? If you use disposable nappies for your little ones, consider cloth nappies even if you just buy a reusable nappy for trips to the swimming pool, this will help to reduce the waste you produce. Categories: community engagement, composting, Environmental Campaigns, Food waste, garden waste, recycling | Tags: A rubbish diet that we can guarantee will work!, bin diet, Charlotte Kelly- Skinner, Deptford resident on rubbish diet, love food hate waste, reduce, reducing food waste, reducing waste, rubbish diet, rubbish diet in Lewisham, slim your bin | Permalink. 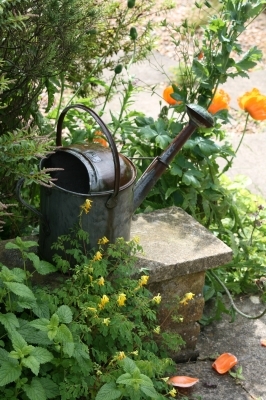 Plant material should be no bigger than 4 inches in diameter (logs, large branches etc.) and green waste can be brought in plastic sacks or, preferably, reusable bags. November 25th is your final day for dropping off your green waste at our satellite sites. Proof of address and ID must be shown to enable you to use the service and no trade waste, trailers or open back vehicles are accepted. You can purchase 10 heavy-duty green garden waste sacks from the Council for £10 from your local library or through contacting CallPoint on 020 8314 7171. When a bag is full, you simply ring the number on the side of the bag and arrange a collection time with the Call Centre. 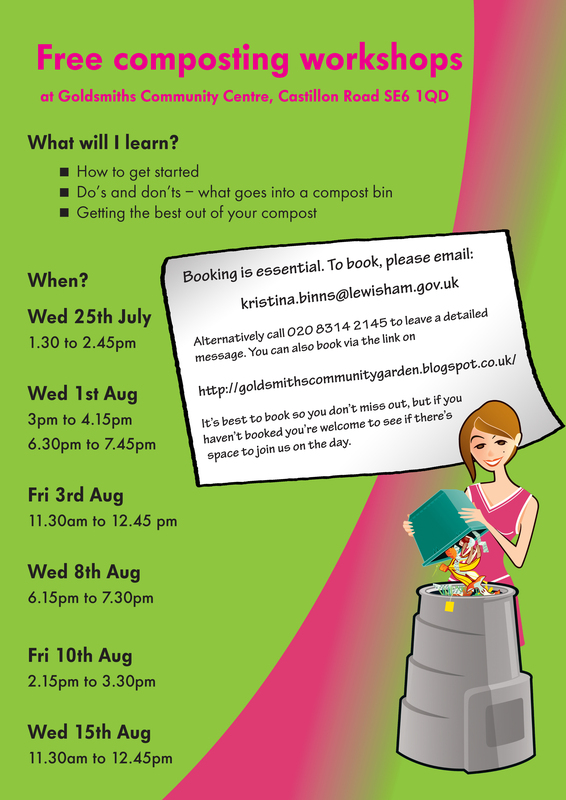 Why not take up the Council’s offer of a free compost bin and free composting lessons. The Council is doing this to reduce the amount of food and garden waste that gets thrown into black refuse bins. You are able to put a variety of things into your compost bin including grass cuttings, raw vegetable peelings, tea bags and coffee grounds. Ring CallPoint on 020 8314 7171 to request a free composting bin. 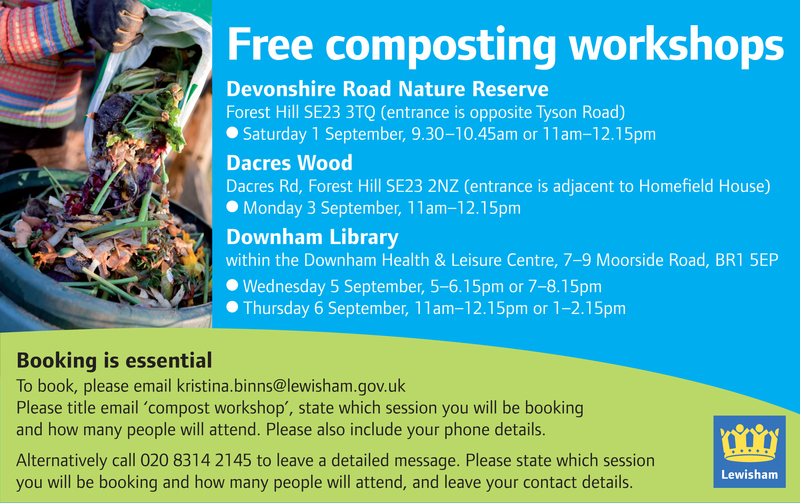 Email recycle@lewisham.gov.uk to register for a free composting lesson. Categories: composting, garden waste | Tags: garden waste, garden waste collection, garden waste collection points, garden waste collection sites 2012, garden waste collection sites finsih 25th November, Garden waste satellite sites, green waste, green waste satellite sites, Lewisham's garden waste collection sites | Permalink. Many schools across the borough compost their food waste and children are very accustomed to placing the skins from their bananas and their apple cores into a compost bin at the end of break time. However, composting at one local school – Horniman Primary, was so successful that they ran out of space- with their compost bin overflowing with fruit, vegetable peelings and shredded paper. The dilemma facing the school council was what they should do with all their kitchen and garden waste, so under guidance from their class teacher- Mrs Brand, they put pen to paper and wrote to the Environment and Community Development (ECD) team requesting help. Keen to encourage the school to reuse and reduce their waste, members from the ECD team offered a couple of hours of their time to build the school a new, larger capacity compost bin. 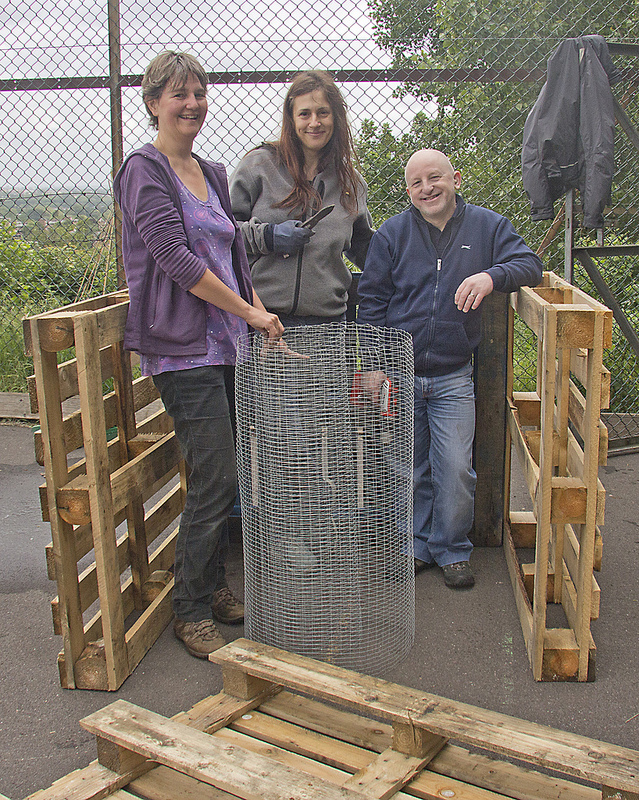 Using old pallets accrued from deliveries to the teams Wearside offices, they set about building the new bin aided by an officer from Lewisham’s pest control team who made the bin rodent proof. Also helping was the schools gardener- Rosie Holland. 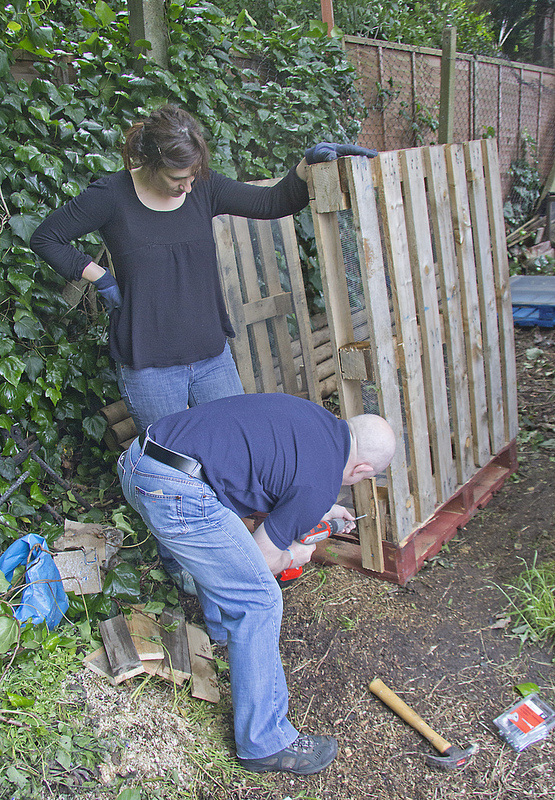 Reusing and recycling old pallets to construct the compost bin. Two members of the school council Jamal Suleiman and Isabella Lloyd were amongst the first to use the new bin, starting it off by putting in garden waste. 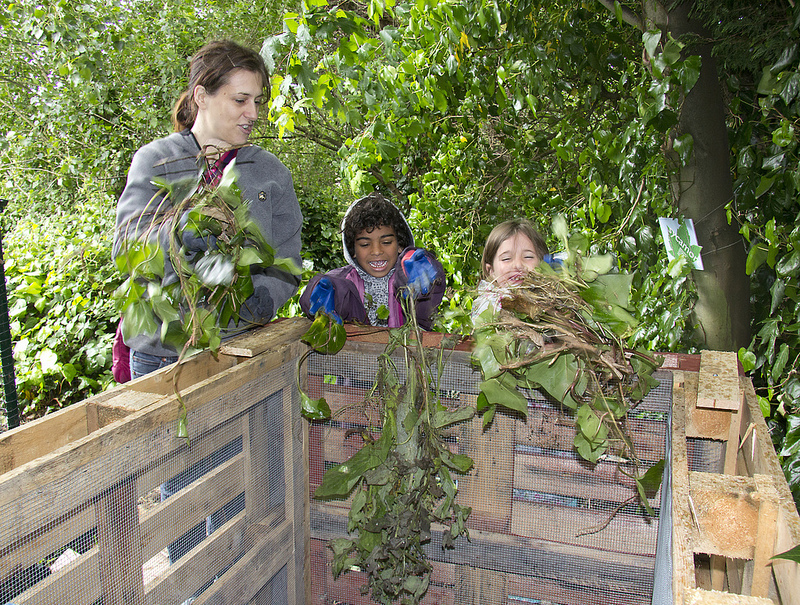 Children from Horniman Primary School start to use the new composter made from the pallets. Categories: composting, garden waste | Tags: compost, compost bins, composting, Composting at Horniman Primary School, constructing a compost bin, Making a compost bin out of pallets | Permalink.